After comparing pinhole and body cap “lenses” I decided to continue my little lens comparison series. In this post I list and compare all available interchangeable pancake lenses. Pancake lenses are compact in size, lightweight and affordable. Their simple optical elements designs deliver exceptional, sharp image quality in a minimal package. A short lens will improve the handling and balancing of the camera, overall it is much more convenient to work with a lighter camera and lens combo. Pancake lenses are very popular among travel- and street photographers because of their high portability and unsuspicious appearance on the camera body. With a shorter lens a photographer is perceived less of a professional shooter. He/she can use this in favor to photograph more candidly. In fact people are curious about lenses of this size and might start a conversation with you! A good pancake lens has potential to become the “everyday” or “always on” lens, especially when used in combination with a capable mirrorless camera body. The typical field of view for a pancake lens is between 40mm and 45mm (full frame equiv.) – 16 out of 35 pancake lenses provide a “normal” field of view. The widest field of view of a pancake lens is 17mm (full frame equiv.) – The MS Optical Perar 17mm f/4.5 is the pancake lens with the shortest focal length. The longest field of view of a pancake lens is 105mm (full frame equiv.) – The Pentax SMC-DA Limited 70mm f/2.4 is the pancake lens with the longest focal length. The fastest aperture of a pancake lens is f/1.7 – The Panasonic Lumix G ASPH 20mm f/1.7 is the fastest pancake lens. The lightest pancake lens weights 52g. – The Pentax SMC-DA XS 40mm f/2.8 is the lightest pancake lens. The shortest pancake lens is only 5mm thick. – The MS Optical Super Triplet Perar 28mm f/4 is the shortest, non-folded pancake lens. The most pancake lenses are available for the Pentax K mount. – 9 out of 35 different pancake lenses are available for the Pentax K mount. The table below lists all pancake lenses, basic characteristics, links to (video) reviews and affiliate links to buy them on Amazon and/or Ebay. The table columns are sort-able. Click on a column title to sort the entries (A-Z) or numeric. Use the search field on the upper right side of the table to filter out and display only entries with specific terms. Enter “Pentax” in the search field and only Pentax mount lenses will be displayed in the list. 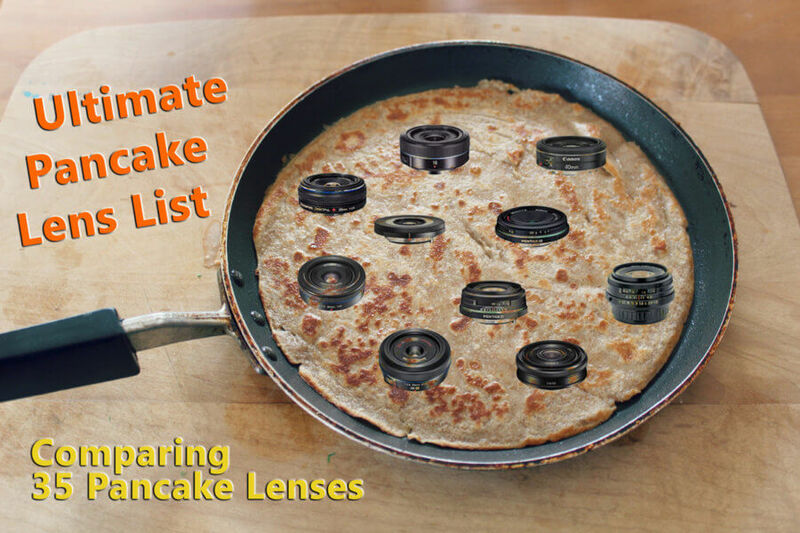 Share a comment if you find your favorite pancake lens missing in the list, thank you very much! Samsung also has a 10mm Fisheye pancake lens. The only of its kind aside from the noted 18mm Takumar (which I also own, funnily enough). The 17mm Fish Eye Takumar is at the borderline of what I would consider a pancake but maybe it could be included too. Thanks for pointing to it Jose. After a long time I added the lens to the list. Olympus also has a 38mm f:2.8 pancake lens for their half frame Pen series. You can use this lens with APS-C and micro 4/3sensor cameras with a proper adapter. Some of that Pen lenses can also support full frame too. But I don’t know if it is possible for this lens. Thanks for contributing I added the lens. Its special, there is not much info about it.